Big Springs provides the most necessary element to life and change – water. Water is part of a dynamic system that interacts with the land, causing change. How strong is Walnut Creek’s flow passing under the bridge? 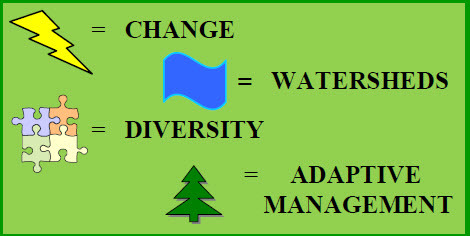 The strength of the stream flow determines the amount of change water can inflict. Where the slope is steep or geologic processes are at work raising the land, stream flows are faster, stronger agents of change that cut into and erode landforms (like the Colorado River through the Grand Canyon). Look at the clear waters of Big Springs. The slope is gentle and the stream banks are protected from erosion by vegetation. This kind of stream has less down cutting and sediment input, resulting in clearer waters. Now look at the pebbles and sediment in the stream bottom. The stream’s current is an active force of erosion and deposition, constantly moving sediment and changing landscapes. If stream flow slows enough, streams may change over time by dropping the sediment they carry. This deposition of sediment can displace the water sideways, causing the stream to spread out and change its course. Does the stream flow at Big Springs affect areas outside of Big Springs? This stream supplies water, sediment and anything carried by the water along Walnut Creek and into Rainbow Lake downstream. The habitat needs for ⅔ of all wildlife in Arizona are directly tied to water associated with streams, wetlands and lakes. Migrating bald eagles may be seen in the Pinetop-Lakeside area from November through March.